M4V Converter Plus is an all-in-one video converter application for Mac OS X, it can convert any video files including DRM files in your iTunes to unprotected M4V or MOV files. The trail version of M4VConverterPlus can only convert 1 minute of each video you want to converter. After you have bought a license, we'll send you keycode with Email. 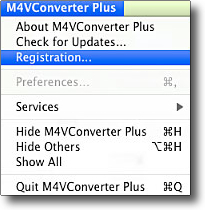 Tips: Before you start to register, we advise you to download the latest version of M4VConverterPlus, and install it. Step 1: Run M4V Converter for Mac. 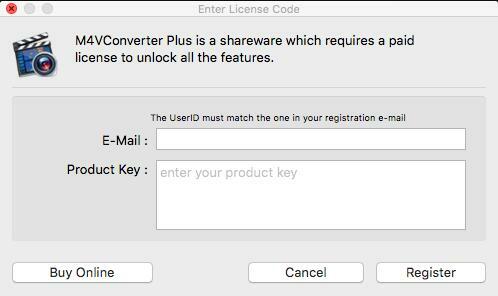 First you should click the M4V Converter Plus menu, and then select the Registration... option to register your M4V Converter Plus. Step 2: You should filled with User ID and Register key in the input blanks reference below figure. You may use command+c to copy and command+v to paste in the window. 1. Make sure the both User ID and Register key are provided by our company after you pay the registration fee. If you have not paid, please click Buy online to purchase. Step 3: When the Registration finished, and then M4V Converter Plus is full version without limitation.